Luna Optics have recently released their new range of night vision devices and thanks to the guys at Opticalia (the UK distributors), I was lucky enough to get my hands on their high powered LN-NVM5-HR Night Vision Monocular and below you can read my complete review and findings after a full month of testing and using them. Aimed at the consumer market as opposed to the military or law enforcement, these mid-range Gen 1+ monoculars cost a fraction of Gen 2 and 3 devices, yet they promise to still provide the user with an a very high level of performance making them ideal for a wide range of uses including personal and company security surveillance and general wildlife observation, be that for hunting, on safari or your family camping trip. The overall shape and design of the Luna Optics LN-NVM5-HR Night Vision Monocular is fairly typical for a compact NV monocular, in that it is designed to be operated mostly with one hand in a similar way to a personal video recorder. However unlike most camcorders and some NV devices, it does not come with a hand-strap, but instead has a wrist strap that will prevent you from dropping it onto the ground, but does not give you the added support you get with a tight strap around your hand. Having said that, it's size, shape and the positioning of the buttons made it fairly simple for me to use one handed and you only really have to use the other one to adjust the focus. What is more, you can reach the buttons with either hand and so it will not matter if you are left or right handed. There are two buttons on the top of the device, the one nearest the objective lens activates the IR illuminator, whilst the one nearest the eyepiece is the main off/on switch. If you look at the image below, you can see that just to the right of them, there are two very small LED indicators that let you know if either or both of these buttons are activated. A small detail that I really like is that Luna Optics have purposely designed them so that at night as the user you can see them when on, but they do not emit too much light, which could interfere with the view, but which could also could give away your location, which in some situations could be very important. On the underside there is a prominent thumb indent which just guides you to hold the device in the right place and in the right way. Then just in front of that you will find the recessed thread that you can use to attach a tripod to the LN-NVM5-HR. Apart from the eyepiece and the objective lens barrel, most of the body is covered in a very thin and very hard rubber coating. This coating is way too hard to provide much protection for larger impacts like if you were to drop it and it is way to hard and smooth to provide any sort of extra grip. But what it will do is provide a little muffling and dampening of any sounds and is less reflective than exposed metal, both of which will help keep your location a secret. Under this rubber coating, the main chassis looks like it is made from a metal, which I think is aluminium, which even though it is not as light as the plastic ones that are often found at this price level, it is far more robust. Like the body, the lens housing looks like it is fabricated from aluminum and the objective lens is set at around 7mm within the end of it, which will help to protect it from scratching and shelter it from dust and light rain when the cap is removed. Luna Optics advertise the dimensions as being 19.5cm long x 5.5cm high x 8.3cm wide (7.7in x 2.2in x 3.3in), which I can confirm after measuring is about right, give or take a millimeter here or there. This does make the Luna Optics LN-NVM5-HR NV Monocular a little larger than the most compact devices out there and will only fit into larger jacket pockets, but it is still small enough to make using it one hand comfortable and it is still fairly easy to pack away in your bag when travelling. The included carry pouch comes with a belt loop, which for me was a great and secure way of carrying it about in the field. 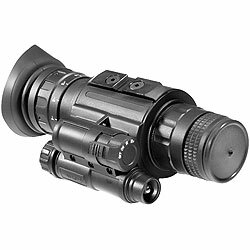 With an advertised weight of 23.9ozs (680g / 1.5lbs) this Luna Optics Night vision monocular is a fair bit heavier than most others that I have reviewed, however as we have already discussed, it has a full metal body, which compared to many of the plastic ones in this price range is in my opinion superior. 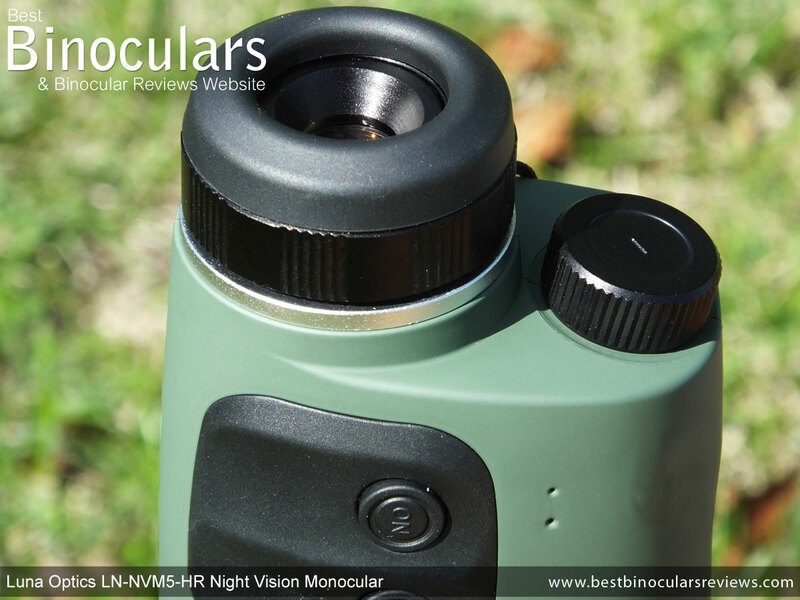 The Luna Optics LN-NVM5-HR is described by the manufacturers as being waterproof, which is excellent as it is not something that I have seen on many night vision devices at this price point and is just another indicator of the quality and attention to detail of this device. Located on the side of the body is the built in Infrared (IR) illuminator, which if you switch it on using the button on the top of the device, emits an infrared beam of light. This light is invisible to us, but acts like a powerful torch light to the device which is very sensitive to infrared, meaning that you can use it to "see" in complete darkness when there are no other external light sources like street lights, the moon, stars, etc. The battery compartment is located behind the IR illuminator, next to the eyepiece and is accessed by unscrewing a spring loaded cap. Like many similar devices the LN-NVM5-HR uses a single 3v Lithium Cell type CR123A battery, one of which comes included and replacements can be quite easily obtained, especially on the web. Luna Optics say that the operating time of the device using this battery is about 75hrs without turning on the IR and about 10hrs with the IR switched on, which is about the same as most others in my experience. Whilst I never measured the actual time I used it for, I tested and used the device over fairly long periods and over the course of a few weeks and never had to change the battery once which is fairly impressive. 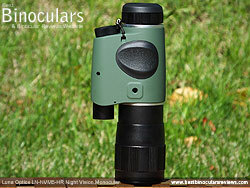 Once you have adjusted the eyepiece so that the ocular lens correctly focuses onto the phosphor screen for your eyesight (see Eyepiece & Ocular focussing below), adjusting the focus of the LN-NVM5-HR depending on the different distance that you are observing an image at simply involves turning the main objective lens barrel at the end of the device. This turns with a reasonable amount of resistance so as to prevent accidental movement and whilst it is made from aluminium, there are a number of deep channels cut into it to improve the grip and I found that even with thick winter gloves on, it was easy enough to adjust. To take it from one extreme of the focusing plane to the other takes just one full turn (360°) of the barrel, which is a little less than others that I have used and so will speed up the process. When you look into the ocular lens on this and all other similar NV devices, you are not actually looking through it as you do on a standard daytime monocular or binocular. 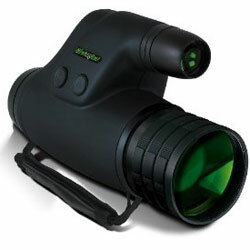 Instead you are viewing the phosphor screen located on the back of the intensifier tube inside the monocular. So in order to get a completely sharp image, you first need to set up the eyepiece to match your eyesight to correctly focus onto the screen. This is fairly easily achieved by rotating the metal ring located on the eyepiece until you get a sharp image. This diopter has an adjustment range of +/-5 and only really needs to be done once (unless you change it) when you first set up the monocular. As with the body the eyepiece housing and the adjustment ring are made from metal, which as with the rest of the body is an improvement on the plastic ones found on many at this price point. The eyecup itself is made from a fairly soft rubber for comfort and has an external diameter of 42mm, whilst the ocular lens has a diameter of 13mm. 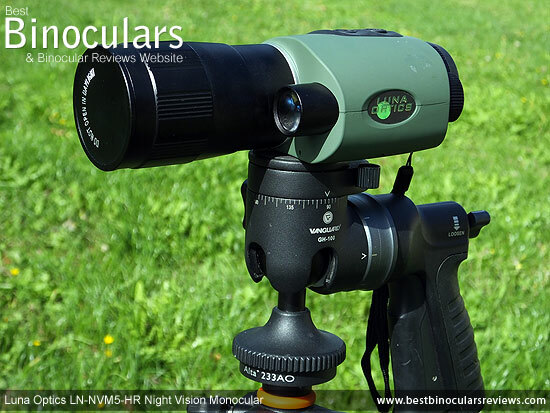 Another small, but important feature on this LN-NVM5-HR Night Vision Monocular is that has a built-in tripod mount located on the underside of the body which makes it really simple to fix it to a tripod for the steadiest of views. I also found this great if you want to keep the device trained on a specific area over longer periods of time. To mount it, all you have to do is screw the tripod head or the quick-release plate (if your tripod comes with one) into the recessed mount that accepts the standard ¼ inch tripod threading. For a demonstration, take a look at the walk-around video below. As you can se from the photos, I tested it using my Vanguard GH-100 pistol grip that I use for all my photography, mounting binocular, spotting scopes and now night vision monoculars! I can highly recommend it, as it really helps to make aiming this and almost all other optical instruments that I have added to it as simple and as quick as possible. 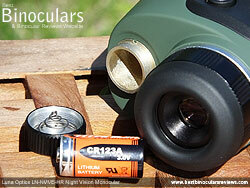 As with almost all other optical devices, the larger the objective lens diameter, the more light you can collect, which especially for any night time product is very important, which is why binoculars for astronomy tend to have very large objectives compared to those designed for daytime use. The problem with this is the larger the lens, the larger, heavier the device will get and so you need to get the balance right depending on what you aim to use the product for. As a monocular which is designed to be portable, the 50mm objectives are bigger than on many similar devices that I have used so does make it a little bigger and heavier, but I am sure it helps to produce a better, brighter image. 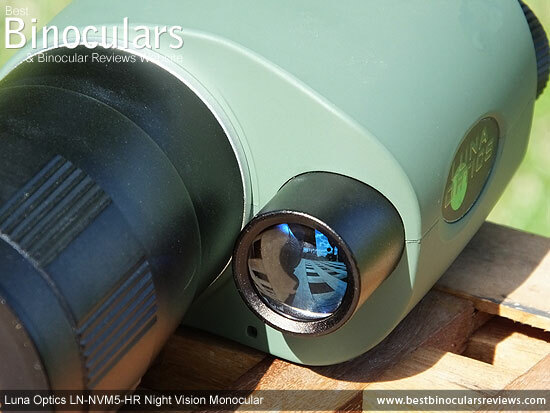 Considering the powerful 5x magnification, the 15° angular field of view is very good, it is way better than the last 5x monoculars I reviewed, the Luna Optics LN-SM50 and is almost as good as many that have a lower power. This does make quite a big difference as it enables you to see more of what is going on around you at any one time, which at night is very important and will help you find what you are looking for far more quickly. Luna Optics do not advertise their official minimum focussing distance, but I was easily able to focus in on objects at less than 1 meter (3ft) away, which I think considering they have a 5x magnification is truly excellent and is as close as I have ever seen before an similar devices (see the comparison table below). 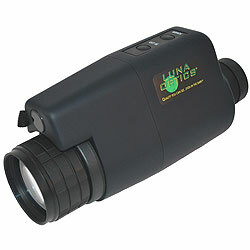 According to Luna Optics, the "typical range of view" is approximately 250m (820ft). This will change depending on many factors including how much available light there is or if their is mist or fog in the air. I will back this up as I was easily able to make out, in pretty good detail a line of trees that are around 250 meters away from my house and had there been any wildlife there, would have easily been able to observe it. They don't state hat the effective range of the IR is, but I could see that it was still making a difference to the trees that I was looking at about 250 meters away, but obviously at closer distances it make a much bigger difference. Luna Optics describe the intensifier tube as being a Gen 1 Hi-Resolution device, which I have not seen being used anywhere else so can only assume it is their own terminology. However it does differentiate them from some of their own Gen 1 products as not all of them are described as being "Hi-Resolution". Here it is important to understand that some Gen 1 tubes will outperform others and you can get a wide range in performance levels. During manufacturing the tubes are graded depending on their performance relating to their light amplification and image clarity and then are sold to the makers of NV devices at a price which reflects their grading. Whilst I may not use or test as many NV products as I do day time binoculars, I have now looked and used quite a big range and I have to say that one of this aspects about NV that impresses me the most is how they keep getting better as the technology improves. In the past a Gen 1 device would make a rather loud humming sound and you would get a lot of blemishes and speckling on the screen which are caused by the intensifier tube as it sends the electrons speeding onto the phosphorous screen. The LN-NVM5-HR is basically silent, with an excellent quality image and whilst you still get some speckling when it is very dark, there were only for or five very small blemishes in my view which I have to say is really impressive and far better than would I would often see on more expensive instruments a few years ago. Considering that this has a powerful 5x magnification and that it is a monocular and thus will not capture as much light as a binocular with the same size lenses, I thought that the brightness of the image that you see, even when it was very dark was very good. Luna Optics state that this device amplifies the light to a minimum of 500 times, which is about as good as it gets at this level and they use a reasonably large 50mm objective lens that will capture more light than one with a smaller lens of the same quality. Higher powered devices like this are also often not as bright as lower powered ones as they need thicker glass to magnify the image, which in turn will allow less light through it than thinner glass, which is why I was so impressed when I compared the view through these with a 3x Gen 1 monocular that I have as to me the image brightness was about equal. 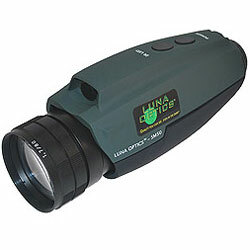 Luna Optics rate the image resolution as being 32-34lp/mm, which is usually a measurement taken at the center because the image becomes more and more distorted the further you get to the edges of the view. This resolution compares reasonably well with other similar devices (see table above), but what I was really impressed with was that once you have correctly focussed the device, compared to many others that I have used, the view was comparatively flat with a little less distortion on the edges. Designed to be used when it is completely dark, or when there is very little ambient light, the IR illuminator acts like a torch, emitting a light which the device is sensitive to, but which is invisible to our eyes. So just like a torch, it emits a narrow beam of light that is far more effective at closer ranges than it is over longer distances and whilst the power and effectiveness of the IR may not match specialist products like the Luna Optics LN-ELIR Super Long Range Laser IR Illuminator that can be bought separately and added to some devices, it is still as good as any onboard ones that I have ever used with a good range to it. I was able to see a small difference by turning it on when looking at some trees about 250 meters away, but for it to be really effective you need to be looking at objects at about 50 meters or less. The included soft carry bag or pouch is fairly simple, but looks well made (see the walk-around video below). It has a large Zipper that makes it simple to take the device in and out, although you need to be careful if you want to keep your position hidden as it can make a fair amount of noise. It is only lightly padded and so you will still need to make sure to take care of your device and not don't drop it when it is inside. Also included is an adjustable shoulder strap that can be connected or removed using a couple of quick release buckles that works really well. On the rear of the bag is a belt loop, which is perfect if you want to keep it in a safe place without it swinging about. Unlike many at this price range, the objective lens cap is made from metal and not plastic. Whilst this may be a small point, it does show a good attention to detail and demonstrate that like the main body is of a better quality than most in this class. The cap is threaded and screws securely onto the end of the body. Like all other NV devices, it should be kept on in daylight, but it has a small hole in the end of it, so you can test the monocular during the day. 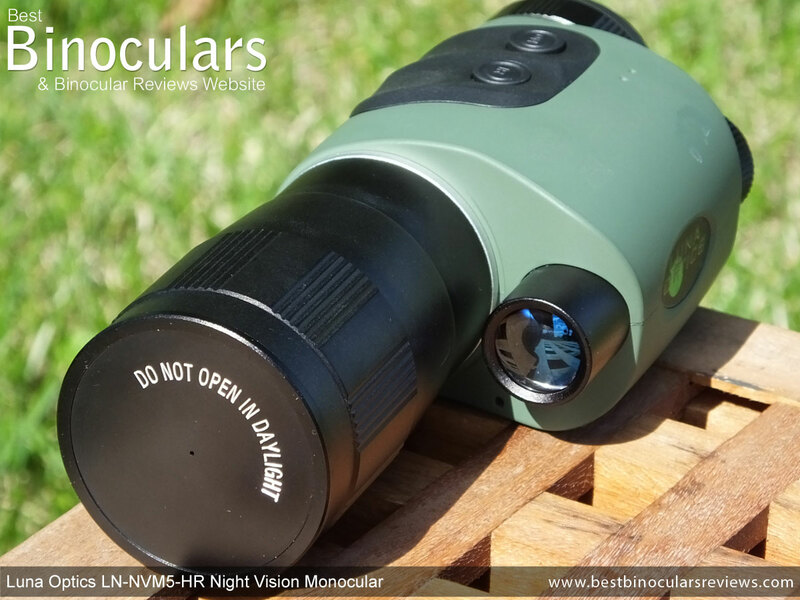 Unlike many daytime bins and monoculars, the cover is not tethered to the device, which is something that I think Luna Optics and indeed all other NV monoculars that I have tested are missing. At night it is much easier to drop and/or loose a small part like this if you are not careful and so I am surprised that they don't come with a way of keeping them attached when unscrewed. 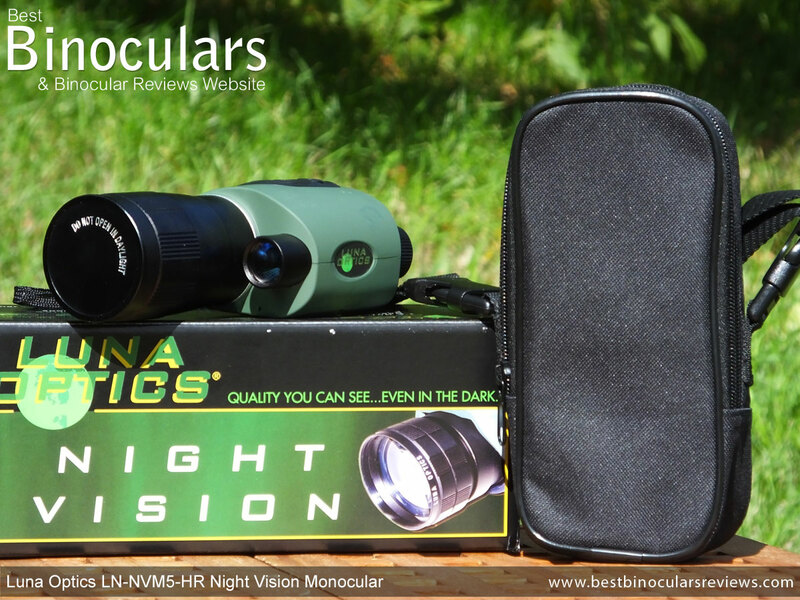 Also included in the box is the warranty information & registration card, which states that the monocular is warranted to be free of defects in material and workmanship for a period of one year from the moment of original purchase. Luna Optics also provide a lens cleaning cloth and an instruction manual, which briefly explains how the how night vision works, how to use the infrared illuminator, how to work the monocular, change batteries and troubleshooting. 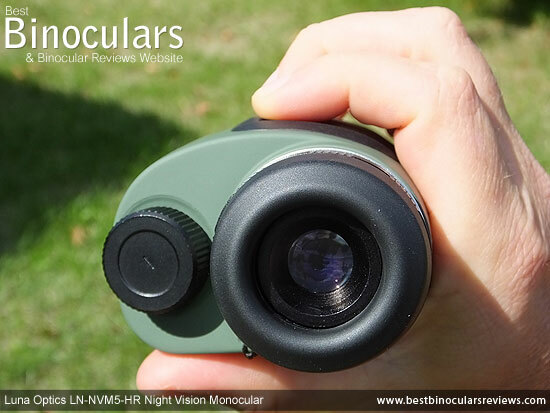 I continue to be amazed by how much and how fast night vision products are progressing and these Luna Optics LN-NVM5-HR monoculars are no exception. For what is a comparatively low cost device, you are getting a great quality instrument that only a few years ago would have had a much larger price tag. Strong Points: The overall build quality and attention to detail is excellent and far, far better than what I would expect at this price. For example he fact that they have a metal chassis means that they are a little heavier than the plastic devices, but I think this is a small trade off and one that is well worth it. 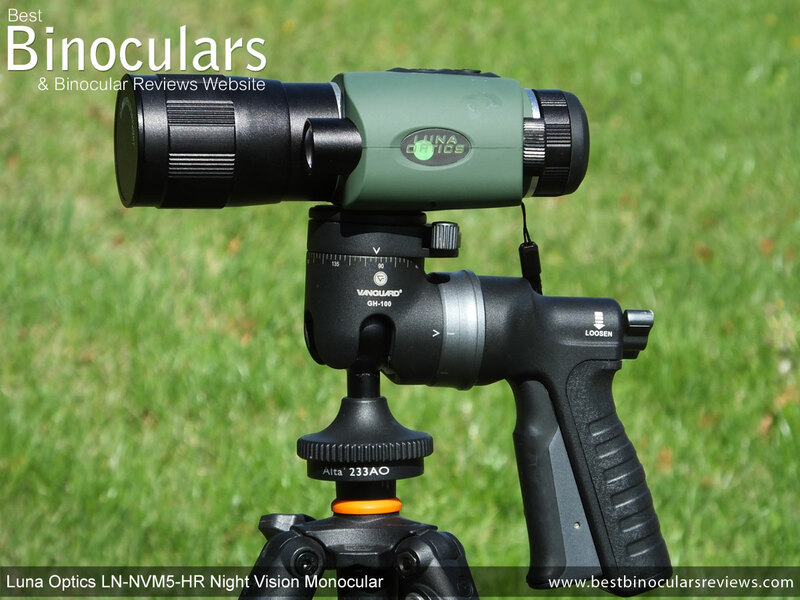 The additions of a built in thread for attaching it to a tripod and the fact that it is waterproof is not only potentially useful, but it is a sign of the quality that is not often found on a night vision device within this price range. For a Gen 1 device the image quality is excellent, with almost no blemishes and remains flat and sharp across a wider area of view, with only a relatively small amount of softening on the edges that what I have become used to. Weak points: Compared to other Gen 1 NV monoculars, these really have very few weaknesses and no major ones that I can think of. There are a couple of niggles, for example it would be great to have a tethered lens cover, which would prevent you from misplacing it, or having to search around in your bag to find it in the dark. An eyepiece cover may be a good idea as well. I would also like to have had a eyepiece with a eye-shield on it that would help block out any light entering from the sides. 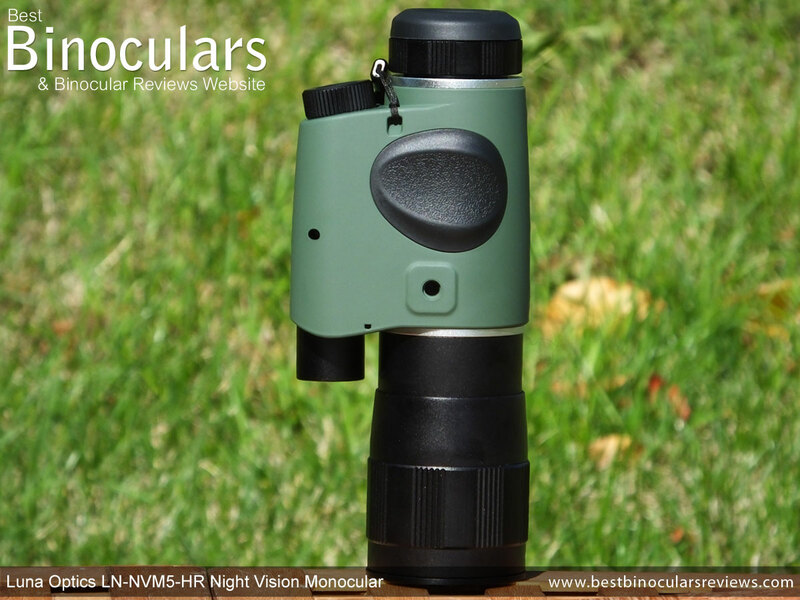 Ideal Uses: At this price and size, the Luna Optics LN-NVM5-HR Night Vision Monoculars will appeal to many looking for a relatively low cost, but effective night vision device for a whole range of uses. Ones that I can think of where these will be ideal include both personal and security surveillance, especially over larger distances where the 5x magnification really comes into it's own. 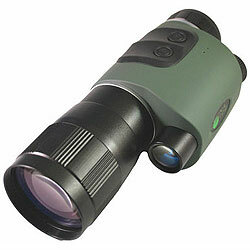 For night time wildlife observation these are ideal and I just can't wait to take them with me on safari. Because they are so compact and reasonably light weight they are very simple to carry around and pack away in a bag making them great to take with on any camping or hunting trip where you will be spending the night in the wild and want to not only take a look at what is around you at night, but get an excellent view of the stars.